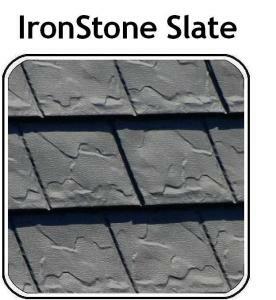 JAMF is a distributor of Rare Manufacturing Inc. metal roofing shingles. All of these products have a Kynar finish and come with a lifetime warranty. They are offered in a wide variety of colors. 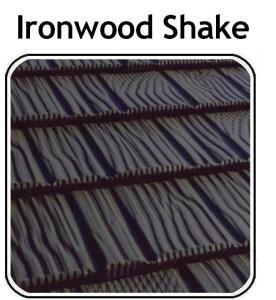 Rare Manufacturing Inc. offers four different profiles of their metal shingle – Ironwood Shake, IronStone Slate, Heavy Shake and European Tile. JAMF carries standard trims or we can fabricate any special trims you need. Remember, if you can draw it, we can fabricate it. Click on one of the pictures for details on a specific style. Lightweight: 50-70% lighter than a traditional asphalt shingle roof. Decreases load on roof with snow build up. Resistance: Most resistant roofing material to fire, hail and wind. Energy Efficient: You can typically expect to save 20% a year on heating and air conditioning costs. Metal roofs have up to 50% more reflectivity. This keeps your home cooler in the summer. Quality metal roofing meets the federal governments Energy Star Program. Lower Insurance Costs: You are eligible to receive a discount on homeowners insurance in Michigan through certain carriers. This further repays your investment. Color Choices: Metal roofs are offered in a wide variety of colors. This gives a home greater eye appeal. Architects are demanding metal roofs on their commercial projects because of the inherent good looks of metal. Water Tightness: Metal roofs have much greater water tightness then traditional roofing. This greatly reduces the chance of mold. Save on Tear Off Costs: Most metal roofing can be put on over existing roofing.